Macrobiotic Adventures | What Is Macrobiotics? Macrobiotics is based on the view that we are the result of and are continually influenced by our total environment, which ranges from the foods we eat and our daily social interactions to the climate and geography in which we live. The term “macrobiotics” comes from Greek (“macro” meaning “large” or “long”, and “bios” meaning “life”) and is based on principles, theories and practices that have been known to philosophers, scholars, and physicians throughout history including Hippocrates, the father of Western Medicine. In the 18th century, German physician, Christoph Wilhem Hufeland first used to the term to describe the “Art Of Prolonging Life” in his book of the same name, the full text of which can be read by clicking this link here. Its most recent development stems from Michio and Aveline Kushi and their many followers, including renowned Macrobiotic Counselor, Denny Waxman. Michio and Aveline were originally inspired by philosopher-writer George Ohsawa who published numerous works in Japanese, English and French, which combined the western traditions of macrobiotics and dialectics with ancient traditional oriental philosophy, science and medicine. In considering all factors that influence our lives, the macrobiotic approach to health and healing views sickness as the natural attempt of the body to return to a more harmonious and dynamic state with the natural environment. As what we choose to eat and drink and how we live our lives are primary environmental factors that influence our health and create who we are, the macrobiotic approach emphasizes maintaining orderly daily dietary and lifestyle habits in closer harmony with the natural environment. By using macrobiotic principles to address and adjust environmental, dietary and lifestyle influences, thousands of individuals have been able to prolong their lives by recovering from a wide range of illnesses including heart disease, cancer, diabetes and many others. 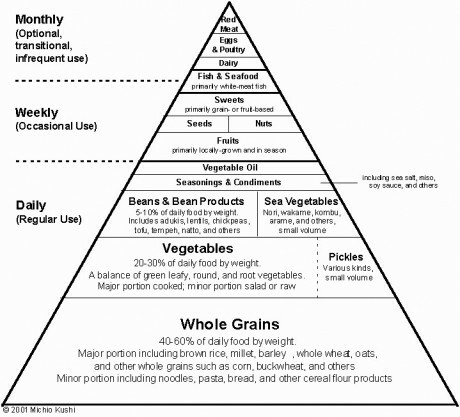 Some traditional and basic macrobiotic practices include eating more whole grains, beans and fresh vegetables, increasing variety in food selections and traditional cooking methods, eating regularly and less in quantity, chewing more and maintaining a positive mental outlook and an active productive life. General dietary and lifestyle guidelines for persons living in a temperate, four seasons climate have been established by Michio Kushi. These guidelines outline basic dietary proportions along with healthier lifestyle habits and are not intended to define a specific regimen that one must follow, as additional adjustments are required for individual application which will vary according to personal situations. 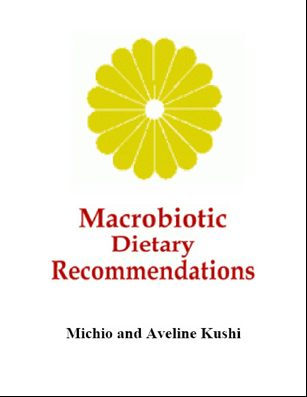 Following are Michio Kushi’s standard macrobiotic dietary and lifestyle suggestions.